I've never been into Filipiniana stuff. I became conscious of that in college, when I was in the Filipiniana part of the campus library, looking at the books, and all of a sudden this thought flashed in my head: "These books don't interest me." I've always been a book lover. I'm not a history buff but I could see myself poring over world history books, just not Filipiniana stuff. I guess I was one of those people who overlook things in their own backyard. 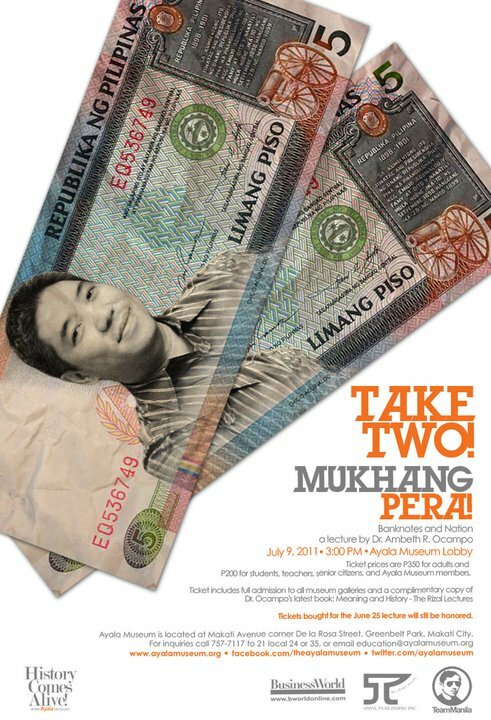 So when bf expressed his interest to attend Ambeth Ocampo's lecture (it was already expected that I would be coming along), I wasn't exactly jumping for joy. Ambeth Ocampo's name was familiar but that was it. The ticket was at P350. A complimentary book was included, which surprised me -- P350 was already more than affordable for a popular historian's lecture; a free book sounded too good to be true. Bf was excited to go to the lecture so we ensured seats by paying in advance. Unfortunately, the lecture had to be rescheduled due to bad weather. So we went July 9 instead of June 25. We were 20 minutes late. I was expecting the Mukhang Pera lecture to start a little late since the weather was bad, but I was mistaken. 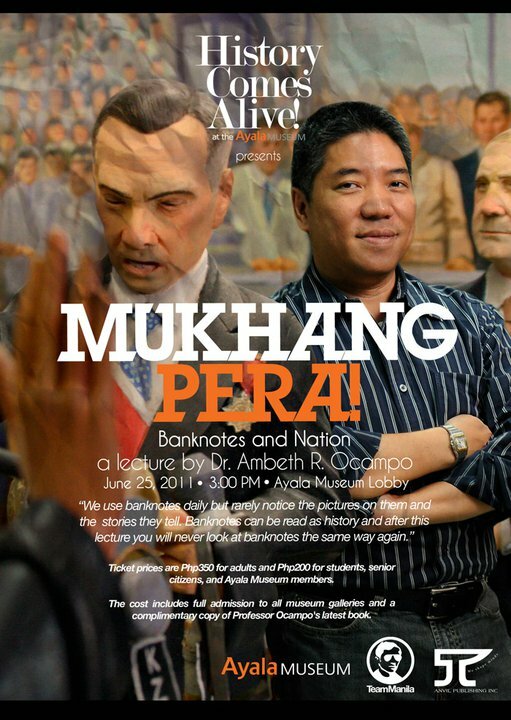 By the time we arrived at the Ayala Museum, the place was already jampacked with people. Since we were late, we had to stand even though we had prepaid tickets. It was understandable that our seats were given to others; however, when a group of guys arrived later and insisted to be seated, the ushers were somehow able to point them to vacant seats. This annoyed me so during the first few minutes, my attention was not completely on the lecture. A few minutes afterwards, the ushers, probably seeing my sour face, brought in some seats for us. That changed my mood and I was able to enjoy the lecture then. A big part of the audience was composed of students and young professionals. A good thing, definitely. It was reassuring to know that kids nowadays still care about substantial and intellectual things. The lecture was very informative and interesting. Ambeth Ocampo delivered some humorous quips every now and then. He had a good way of telling stories. You won't be tuning out or surreptitiously looking at your watch, waiting for the lecture to end. What can I say, I'm a convert! Now I look forward to more of his lectures. And yes, there really was a complimentary book, his recent one, Meaning and History - The Rizal Lectures. 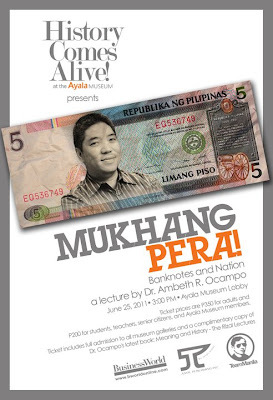 So let's see, for P350, you get to listen to an acclaimed historian's lively and intellectually stimulating lecture about currencies, you're free to roam around the Ayala Museum, and you get his latest book. Quite a deal, huh? And if you're a student, a teacher, a senior citizen or an Ayala Museum member, you only pay P200, so even more sulit! Prof. Ocampo is also a columnist for the Philippine Daily Inquirer. He regularly posts interesting tidbits and pictures at his Facebook page. The poster pictures used above were copied from his page.